A quintessential neighbourhood fish and chips joint, Phil’s started on Purcells Cove Road, though that western location has been closed for a couple of years now, leaving the Quinpool spot as the only place to get what Phil Perrin’s cooking up. The decor isn’t what you’ll remember, it’ll be the crispy batter and succulent fish within, along with a raft of homecut fries. 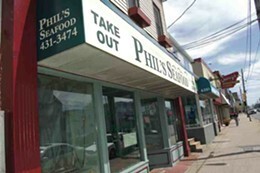 And the fish doesn’t stop there: Try the scallops, clams, haddock or shrimp. Second Runner-up: Fries & Co.